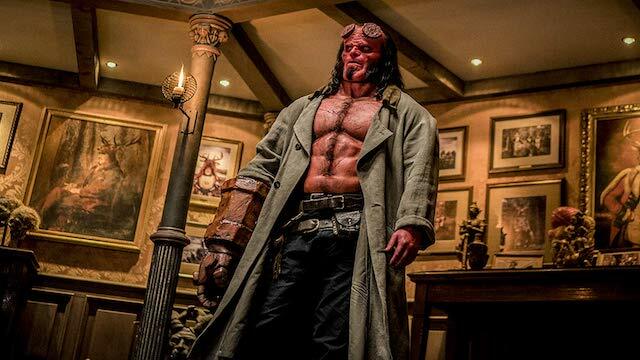 Lionsgate’s R-rated reboot of Hellboy arrives in theaters this week. But a big question fans have about the film revolves around the new actor filling the big red guy’s shoes. Stranger Things’ David Harbour takes over the role from Ron Perlman, who portrayed Hellboy in Guillermo del Toro’s previous films. But judging from a new featurette posted over on ScreenRant, he’s become quite comfortable with the role. While the video isn’t too long, it does feature some input from Harbour himself. In it, we get a good look at action from the film, along with hints at the actor’s regimen. But as you can see in the clip, he has no trouble showcasing his moves. Between both training sequences and a segment in which Hellboy battles someone in a wrestling ring, he can hold his own. Then we get into the makeup, which shows similarities with Mike Mignola’s comic book character. It’s true to form, from the beady yellow eyes to the sanded off horns. “It really takes my breath away, and really helps me become this character,” noted Harbour. The clip does feature some new footage. Along with the fight in the wrestling ring, we also get to see Hellboy take hold of his Good Samaritan firearm for the first time. Fans won’t have to wait too long to see if Harbour can hold his own against Perlman’s take on the character. The movie hits theaters this Friday, April 12. What do you think about the new Hellboy video? Let us know in the comment section below!